FEATURE The shape of the angel wings on the back is vivid and exquisite in workmanship. The sweet bow tie and cute accessories on the head highlight the uniqueness of the toy. 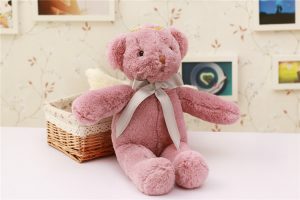 The surface of the bear is soft and comfortable, and the interior is filled with high-quality PP cotton, which makes the entire image of the bear full and vivid.